When Dr. Edward Worth of Dublin died in 1733, he left his considerable library to Dr. Steevens' Hospital, presumably on the grounds that it contained a large number of medical works. Since then his books have remained there undisturbed except by rare readers and the occasional ministerings of successive honorary curators. Their state of preservation is remarkable. Fortunately for students other than those of medical history, Dr. Worth had catholic tastes: he collected major European authors, among them Calderón de la Barca, at the time of whose death in 1681 Worth was three years old. Worth's Calderón is in nine volumes1. The dates and wording on the nine title-pages are consistent with those of the collected edition produced after Calderón's death by his friend Don Juan de Vera Tassis in the decade 1682-91. The dates are all those of the first editions, except for volume II, unaccountably dated 1683, not 1686, and volume V, which is dated 1694. 1694 is the date of the second edition of this volume. The binding of limp vellum, the same in all nine volumes, is the typical original binding of this edition. When the volumes are collated, the suspicion aroused by the odd date of volume II is confirmed. Each play (there are twelve in each volume, 108 in all) is foliated or paginated separately, if at all, and has separate signatures. The preliminaries generally have fewer leaves than they ought, and they lack the engraved portrait of the author which should be present in every volume (except the seventh, most copies of which have an engraved coat-of-arms). The set is in fact a fine specimen of a fake edition, the existence of which is known to some Calderón bibliographers. The word «some» is used advisedly. Nearly a century ago the eminent French hispanist, Alfred Morel-Fatio, drew attention to a fake edition of volume VI, when he edited one of the plays in that volume2. In 1951, the «1683» volume II was exposed as a fake3. Yet the National Library in Madrid continues to preserve in its «Rare» section a set of nine fake volumes. This in itself is not ridiculous, for complete sets of the fakes are indeed rare; the irony lies in the fact that genuine volumes are consigned to the rather more humble «Theatre» section4. The National Library's reverence for the fakes has caused them to be consulted by uninformed editors of critical editions. Such editions are not necessarily «bad» as a result; their goodness or badness is simply an unknown factor. 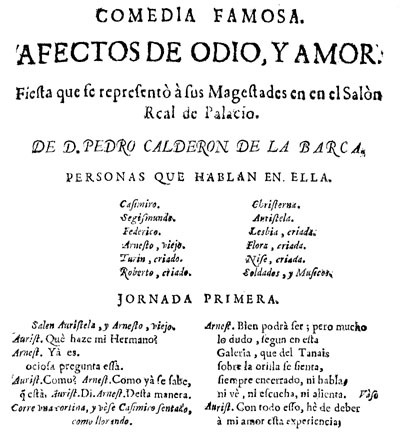 Spanish plays of the seventeenth and eighteenth centuries were most commonly published in one of two forms: singly, as a suelta (literally «loose») or in volumes of a dozen known as partes. The format of both was quarto. The Vera Tassis collection of nine partes was a good edition and enjoyed a favourable reputation at a time when Calderón's own prestige was at its height. Thus Vera's edition offered an excellent opportunity for an unscrupulous person to enrich himself by producing cheap fakes of it. The method used to produce these fakes was quite straightforward. Large numbers of sueltas were collected and bound together in the appropriate order in volumes of twelve each. A somewhat abbreviated (and thus cheaper) set of preliminaries was printed and bound in at the beginning of each volume. It is as if an unscrupulous London printer had set out, round about 1640, to fake Shakespeare's First Folio of 1623, and, in order to do so, had collected and bound together various editions of the Quartos, most of them later than the Folio. The parallel is not an exact one, mainly because the difference in format would have prevented any such faking of Shakespeare's works; and also because Shakespeare Quartos were not printed in the same numbers as Calderón sueltas were. The production of large numbers of Calderón sueltas presents a considerable bibliographical problem, especially since many of them have neither imprint nor date. The problem is aggravated in the case of the fake partes because different copies of the same volume contain different suelta editions. Most of the sueltas are undoubtedly late reprints of earlier editions (especially of the genuine Vera Tassis edition), but a very few are plainly early enough to be important. Some may even be first editions of the plays concerned. Thus an editor looking for early sueltas of a particular play cannot afford to consult only one copy of a fake volume. He must consult as many copies as possible, particularly since late (and less interesting) sueltas must have been more readily available to the fakers than early and important editions. This brings us to our purpose in writing the present paper. Complete sets of the fakes are scarce. We know of only three besides the Worth set: the one in Madrid already mentioned, and one each in the vast Spanish drama collections of the Universities of Wayne State and Pennsylvania5. Our first objective is therefore to bring to the attention of interested persons what appears to be a rather scarce item: a complete set of fake volumes in fine condition. Secondly, we wish to make some tentative suggestions regarding the date of the fakes, suggestions based on the provenance of the Worth set in particular. Finally, we wish to begin the long task of attributing and dating the imprintless sueltas by suggesting a date and a printer for a small number of them. Edward Worth died in 1733, so the set cannot be later than that date. All nine volumes have the name John Conduitt inscribed in the front endpapers, while volume I has the figure 8000 (in the same hand?). Between the 8 and the 000 is a symbol resembling a C or part of an O with two strokes through it. The Dictionary of National Biography tells us that Conduitt held posts with the British forces in Portugal in 1711-12, and although there is doubt about the date of his return to England, he is unlikely to have remained later than 1713, when the treaty of Utrecht ended the War of the Spanish Succession6. The curious symbol following the 8 was often used in Peninsular counting to indicate thousands (rather as we now use a comma), so it seems quite possible that the set was bought there by Conduitt about 1711-12 for 8000 reis (i. e. 8 mil reis). This date is a notional terminus ad quem. Only three of the 108 sueltas have imprints. El secreto a voces (vol. VI) and Amado y aborrecido (vol. IX) were printed by the heirs of Gabriel de León at a date unspecified (their name is found in Madrid books between 1675 and 1737). Las manos blancas no ofenden (vol. VIII) was printed by Joseph Llopis of Barcelona, who very thoughtfully added the date: 1699. This is a provisional terminus a quo. The period 1699-1712 is a good deal earlier than the 1720-26 suggested by Oppenheimer in 1951, but Oppenheimer knew nothing of the Llopis suelta and his figure of 1726 was based on incomplete information about the dates of genuine reprints of the Vera Tassis edition7. We hope to confirm the likelihood of our suggested date by attributing a group of sueltas to a particular Madrid printer working at a specific time. Three of the sueltas in the Worth set use wood-blocks as tail-pieces. Two of them, El castillo de Lindabridis and Duelos de amor y lealtad (both in vol. IX) use a very unusual block: a huge B, 107 by 76mm, on its side (fig. 1). This B belonged to a Madrid printer who had been involved in the production of two Calderón fakes in the early 1670s: Lucas Antonio de Bedmar8. The B is used in La real entrada en esta corte... de la reyna N. S. Doña Maria-Ana Sophia de Babiera y Neoburg, a work written by Bedmar himself and printed without a date, although almost certainly in 16909. It is also present in Bedmar's printing of Juan de Villagutierre Sotomayor's Historia de la conquista de... Itza (1701), and in Antonio Palomino de Castro's El museo pictórico (vol. I by Bedmar, 1715)10. The third suelta to use a wood-block tail-piece is Afectos de odio y amor (vol. III). The woodblock, best described as a plumed head, measures 113 by 47mm (fig. 2). This head is found in the Villagutierre (4S3v) and in the Palomino (3G2v). We have not yet seen either block used before 1690. The period embraced by the three books, i. e. 1690-1715, fits in very well with the provisional dates suggested above for the production of the fakes. The wood-block evidence alone is enough to permit a tentative attribution of the three sueltas to Bedmar, and to support the evidence for a date in the late seventeenth or early eighteenth century. Type provides additional and conclusive evidence. The three sueltas use upper-case J and U rather than I and V. Madrid printers began to use the modern convention regularly only after 1690. But the presence of a few Vs (e. g. JORNADA SEGVNDA in Afectos) suggests that the old convention had not been ousted completely. This general evidence also supports a date at the turn of the century. A more detailed examination of the type shows that it is the same in all three sueltas. Stage directions and speakers' names are set in Guyot's pica italic, which, for the purposes of this study, we shall refer to as IT1. This italic first made its appearance in 1553, on a body of 77mm/20 lines; it is not common in Spanish printing, especially when cast, as here, on a body of 89mm/20 lines (fig. 3)11. The running-heads and author's name of the three sueltas are set in Guyot's great primer italic (IT2). This italic, first used in 1547 with a body of 110mm/20 lines, is admittedly very common in Spain12. There is no way of measuring the body-size in the sueltas, since it is used only in single lines (see fig. 3). The variety of roman founts is rather greater. The main text type is a pica roman with the same body as the pica italic: 89mm/20 lines (see fig. 3). We have not identified the cutter of this face, which we call R1; in any case, it has been adulterated, for there are two kinds of a number of sorts, including queries, a, e, i, r and v. This may well be an old fount augmented with an infusion of new sorts. The small x-height and the crude U and J (obviously later additions) suggest a sixteenth-, rather than a seventeenth-century face; while the half-millimetre space between the descenders of one line and the ascenders of the next suggests that it was designed to be cast on a smaller body than it is here. A second roman (R2, not shown) is used only in El castillo de Lindabridis, to state that the first performance was a royal one. This roman is Garamont's great primer13. The fact that two lines are present enables the body to be measured as 6mm per line, or about 120mm/20 lines. A third roman (R3) is used in the titles of all three sueltas. This is readily identifiable as Granjon's paragon roman from the narrow A and R (see fig. 3)14. It was widely used in European printing from at least 1572, when it was first listed in Plantin's inventories. A fourth roman (R4, see fig. 3) is used in the titling of two of the sueltas, Duelos de amor y lealtad and Afectos de odio y amor. Even the poor condition of the type does not prevent it from being recognised as one of the commonest designs of petit canon (2-line english) ever to be used in Europe. Curiously enough, the identity of the original cutter is uncertain, and it has been attributed to Garamont; but the opinion of experts, including Plantin in the sixteenth century and Vervliet in the twentieth, attributes it to Granjon15. As can be seen from the illustration, the As are particularly badly damaged; this is only to be expected, since A is perhaps the commonest letter in Spanish. A different pair of sueltas, Duelos de amor y lealtad and El castillo de Lindabridis, uses the fifth roman (R5, not illustrated). We have not identified the cutter of this type, which corresponds in size (and in some points of style) to Hendrik van den Keere's two-line pica roman; it is definitely not his, however16. 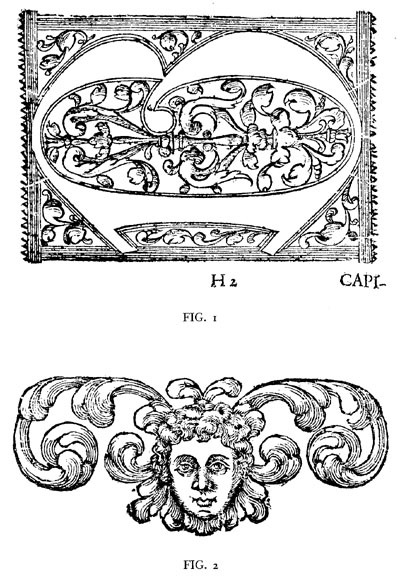 Two other founts of roman capitals occur only once each in the sueltas. R6, a two-line double pica, is used in El castillo de Lindabridis (not shown). The originator of this vigorous design was van den Keere: the notched top of the A and the marked, angled serifs of the T leave no room for doubt17. The slight unevenness in size, however, suggests that some letters may not derive from van den Keere's punches but from copies. When van den Keere cut the face, the letters were 11mm in height; some of the same letters used here appear to be as much as 11.5 mm. Perhaps the discrepancy can be explained by the fact that the point even of a large steel punch tends to «spread» with repeated use. We have not identified R7, a set of 13 mm capitals used in Duelos de amor y lealtad (not shown). The tables show that no suelta has fewer than five of the nine founts. Three founts, including the unusually large-bodied pica roman and italic, are common to all eight sueltas. The condition (and, where valid) the degree of adulteration is the same in all eight plays. The various founts are used to perform the same function (text, titling, running-heads, etc.) in each case, and there are also similarities in typographical style. This evidence confirms that the two groups of sueltas are one group of eight. the first S of LOS HIJOS [de la fortuna]. It is quite different from the correct S of this fount, the S of HIJOS, which happens to be set upside-down in this suelta. We call the rogue S R.8 (:13mm); we do not know who cut it20. Two books printed by Bedmar are especially relevant to this investigation. The first is Fray Tomás Dávila's Historia y vida del admirable y extatico San Furseo of 1699 (copies in BM, G.19613, and Trinity College, Dublin, 62.S.166)21. This book uses IT1 in the preliminaries and index; in both the measurement is 88mm/20 lines. We see no significance in the 1-millimetre difference in size. For one thing, it is well within the norm indicated by Gaskell22; moreover, the difference operates, in proportion, in the other founts used in the Furseo. Almost certainly the paper is responsible. The Furseo is printed on good Genoa paper, the sueltas on indifferent Spanish paper. We suggest very tentatively that the longer fibres of the better paper caused a slightly greater amount of shrinkage. The Furseo uses IT2 for running-heads (as the sueltas do), for chapter-heads and as a text italic. In the text it measures 117mm/20 lines. Granjon's paragon italic, which we have designated IT3, and which is used in only one suelta, is also scarce in the Furseo. In both it is in very poor condition. This appears to be a case of a printer trying to extract the maximum possible amount of use from an old and possibly diminished fount of type. The pica roman we have called R1 is used in the preliminaries of the Furseo. Like IT1, it measures 88mm in this book, but we are quite certain that it is the same fount as that used in the sueltas. R2, Garamont's great primer roman, is used in the preliminaries and text of the Furseo on an apparent body-size of 117mm. R3, Granjon's paragon roman, is used in the preliminaries on a body of 136 mm. In the Furseo, as in the sueltas, it is worn. It may be as old as the Granjon paragon italic, which it matches in body-size. Like R3, R4 shows considerable signs of wear in the Furseo (see A1r) and in the sueltas. Bedmar had some of this typeface as early as 1670, in good condition, and in 1690, in worn condition, but as yet we have no proof that he used only one fount in this lengthy period. The set of titling capitals we have called R5 (:7.5mm), and which is found in seven sueltas, is used in various places in the Furseo, including the title-page itself; it is in good condition. There is one important difference: the U employed in the sueltas is different from that of the Furseo. The sueltas U, with bracketed serifs, is arguably more in keeping with the design of the other sorts, but both Us are probably late additions to an old design which had no U.
R6, the two-line double pica of (or more likely, after) van den Keere, is represented in the Furseo only by an E on ¶7v and a dubious T on 2¶2r. The word HISTORIA on the title-page is set in type of this size (:11mm), but the two are not the same. We are very uncertain about the largest set of titling capitals (:13mm), mainly because of our lack of success in associating them with any punchcutter. There were at least two designs of this size in regular use in Spanish books of this period. The one we refer to as R7 is a good, vigorous design most easily recognised by the bold, right-angled serifs on the «toe» of E and L, and by the very wide O (14mm). We believe that the letters L, O, I, O and the second S of LOS HIJOS [de la fortuna] belong to this fount. The J is not a J at all, but an I with the lower right serif removed, giving it the appearance of a J with a very short «foot». All the letters of DVELOS [de amor y lealtad] seem to belong to this fount also, and there are two examples of it in the Furseo (L on ¶2r, N on 2¶1r). The second 13mm set of capitals in use in Spain at this time is more delicate than the one just described. The «toe-serifs» of E and L are not right-angled, but point outwards, and the O is only 12.5mm wide. Bedmar seems not to have had this fount: we have not seen it in books by or attributable to him. R8, the single S, does not belong to it. While the types used in the sueltas are not exactly the same as those in the Furseo, the existence of a close relationship cannot be denied. The Furseo has examples of IT1, IT2, IT3, R1, R2, R3, R4, R5, R6 and R7. Only the unique S, R8, is not present. In all cases the state of the type also corresponds, whether it is in good or bad condition. If there are any differences in condition, they are of a uniform nature, i. e. the type of the Furseo in general is slightly less worn than that of the sueltas. This suggests that they were produced a little later than the Furseo. The second book of particular relevance is the Villagutierre mentioned earlier (note 10). It contains examples of R1, R2, R3, R4, R5, R6, R7, IT1 and IT2. The only founts it lacks are R8, the odd S, and IT3, the battered Granjon paragon italic, very scarce in both Furseo and sueltas. The condition of all the founts corresponds closely to those of the sueltas. We suspect that they must be very nearly contemporary with the Villagutierre. In particular, they share with it the use of the «second» U of the R5 fount. The presence of this U in the Villagutierre confirms the aesthetic evidence; i. e. that the Furseo U, being cruder, is earlier, and indicates that the sueltas must have been printed after the Furseo. The type of the Palomino of 1715 (see note 10 above) corroborates the evidence of the Furseo and the Villagutierre. Not surprisingly, it contains rather fewer of the types found in 1699-1701. The smaller romans R1, R2, R3 (ranging from pica to paragon) are absent, whereas the titling capitals R4, R5, R6 and R7 are all present. This is normal, for text types undergo much greater use, and have a correspondingly shorter life than titling types. One notable feature of R4 should be mentioned: the battered As used in the sueltas and the Villagutierre have been replaced in the Palomino by a new fount of As which match in size but are not Granjon. This fact proves beyond reasonable doubt that the sueltas were printed before the Palomino. The Palomino also has examples of R8, the stray 13mm S; it may be seen, along with an R7 S, on 4E1r: more evidence, if any were needed, that Bedmar was the printer of Los hijos de la fortuna. As might be expected, the Palomino has only IT2 of the 1699-1701 italics. IT3 was already absent in 1701, and the pica IT1, like its matching R1, doubtless wore out quickly with frequent use. Further evidence, which confirms but does not add to that already supplied, is found in two pamphlets printed by Bedmar. The first is a Real aclamación que... se executo en esta corte el miércoles 24 de noviembre, a single sheet folded twice to make four quarto leaves and printed by Bedmar in 1700; the other is a «true account» of the arrival of King Philip V in Madrid on October 4, 1706: it was printed in Madrid by the Imprenta del Reyno, in the street of los Preciados, the name and address of Bedmar's firm. It too is made up of four quarto leaves. Copies of both are bound in the British Museum's volume 1445.f.2123. The first has examples of R5, R6, IT2, IT3; the second, examples of R3, R4, R5 and IT3. Taken together, the evidence of type and wood-blocks is conclusive: eight unsigned and undated sueltas in the pseudo Vera Tassis edition of Calderón were printed by Lucas Antonio de Bedmar of Madrid between 1699 and 1715. The exact date of printing is less certain; but on the basis of the present evidence, we favour circa 170124. These conclusions tally very well with the other evidence: the fact that another play in the set is dated 1699, and the possibility that a complete set was bought by John Conduitt in the Peninsula about 1712. The conclusions also indicate very clearly the areas in which further research may most profitably be carried out: we hope to attribute other groups of sueltas in the same way. Finally, we wish to record the whereabouts of copies of these eight sueltas. We record only those which we ourselves have managed to examine and to compare with the help of detailed descriptions. The existing catalogues of sueltas (see, for example, note 5 above) do not help us very much here. As a rule, they give abbreviated titles, imperfect collations and summary colophons. Their descriptions are usually too crude to distinguish between originals and page-for-page reprints25. Biblioteca Nacional, Madrid, R/11347(7): pseudo Vera Tassis vol. III. University Library, Cambridge, Hisp.5.68.20(7): pseudo VT vol. III. Worth collection, H.5.4(7): pseudo VT vol. III. D. W. Cruickshank's copy: pseudo VT vol. III. Biblioteca Nacional, Madrid, R/11347(8): pseudo VT vol. III. University Library, Cambridge, Hisp.5.68.20(8): pseudo VT vol. III. Worth collection, H.5.4(8): pseudo VT vol. III. Biblioteca Nacional, Madrid, R/11348(4): pseudo VT vol. IV. University Library, Cambridge, F169.c.8.4(4): pseudo VT vol. IV. Worth collection, H.5.5(4): pseudo VT vol. IV. Biblioteca Nacional, Madrid, R/11348(8): pseudo VT vol. IV. University Library, Cambridge, F169.c.8.4(5): pseudo VT vol. IV. Worth collection, H.5.5(8): pseudo VT vol. IV. Biblioteca Nacional, Madrid, R/11349(1): pseudo VT vol. V.
Worth collection, H.5.6(1): pseudo VT vol. V.
Biblioteca Nacional, Madrid, R/11353(8): pseudo VT vol. IX. Worth collection, H.5.10(8): pseudo VT vol. IX. London Library, P. 105 2(4). Biblioteca Nacional, Madrid, R/11353(9): pseudo VT vol. IX. Worth collection, H.5.10(9): pseudo VT vol. IX. Biblioteca Nacional, Madrid, R/11353(10): pseudo VT vol. IX. Worth collection, H.5.10(10): pseudo VT vol. IX. Perhaps it is worth pointing out that editions of these eight sueltas do not vary from one fake volume to another -at least not in the volumes we have seen. This is by no means a general feature of the fake volumes. For example, we have seen three copies of the fake second volume (Biblioteca Nacional, Worth collection and Cambridge), and each copy has a different suelta edition of the play El médico de su honra. On the other hand, not all copies of the eight sueltas are bound in fake volumes; some were presumably issued as true sueltas, to judge from the London Library copies, which are bound in apparently random groups. In this paper we have attributed eight editions of Calderón sueltas to one Madrid printer. Eight may seem a reasonable number, but it probably accounts for rather less than five per cent of surviving imprintless Calderón sueltas. In the context of Spanish Golden Age drama as a whole, it is a drop in the ocean. Because of their date, these particular sueltas are unlikely to command the interest of critical editors. Some of them may conceivably be reprints of early, now lost, sueltas, and should be checked for this possibility, but they are more likely to have been reprinted from the collected edition they were later used to counterfeit. For the literary historian, on the other hand, the sueltas are of more interest in that they help to build up a picture of interest in, and demand for editions of Calderón plays long after the dramatist was dead. Lope de Vega was at the height of his fame when he died in 1635; Calderón's funeral in 1681 was less of a state occasion. But Calderón's plays were, we suspect, more frequently reprinted and acted during the eighteenth century than Lope's were.